Get OK! 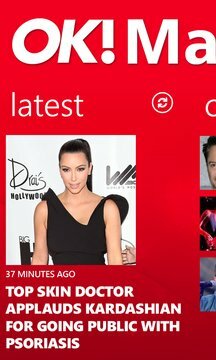 Magazine on your Windows Phone with this new app, bringing the very latest celebrity gossip straight to your fingertips. This new OK! app is updated 24/7 and is completely jam-packed with celebrity stories and photos -- the ultimate guilty pleasure. This brand new app also allows you to read and store up to 200 articles offline, so you can keep up-to-date from absolutely anywhere (even on a plane!). You can even save your favorite articles. If you are running the latest Mango release, you can also pin individual articles to your homescreen. And even better, you can now set the application to auto-fetch new content.